“Whoever designed the streets (in St. Paul) must have been drunk. I think it was those Irish guys, you know what they like to do.” – Jesse Ventura on Late Night with David LettermanWe start in St. Paul, where 7th Street W. (running on old 8th Street) crosses 6th Street, and then 5th Street. Not being from Saint Paul, the obviousness of the answer to the question “Fort Road is a nice, unconfusing, name why didn’t they use that?” escapes me. Our origin is roughly at the Ramsey County Juvenile Facility, which is across from the Children’s Museum. Warning to children “Behave.” We then approach one of the two different Mickey’s Diners on 7th Street. The famous one downtown, and another one down the road a 3.7 miles, the latter is subtitled: “By Willy”. I am sure there is a history here. We then approach Saint Paul’s attempts at economic development: River Centre, the X, parking lots. It is lifeless here but for the Dorothy Day Center, a Catholic charity which feeds the poor and always seems to have a crowd around. Next we get some interesting older buildings mostly on the North Side. (St. Paul’s 7 Cornersneighborhood) This should be a cool walkable neighborhood. It has some seeds (the coffee shop, the restaurant, the DQ, a real hardware store). But the road is too wide (4 lanes + 2 parking lanes, no median, few or no street trees) for this to have the relaxed, free to cross the street mid-block feel that Grand Avenue possesses. Down the road to the west are more institutional and industrial and automobile service uses. Then we get to another neighborhood retail node at Goodrich Avenue. This has a St. Vincent de Paul Thrift Store. Nothing wrong with thrift stores, but they are indicators that rents are on the low side. And then lots of parking. Some more random retail. A Liquor Barrel. The road narrows up some. We go over some rail tracks, and then in the distance, we spy a brewery. Schmidt’s, the beer that made Saint Paul famous. This is being reused for housing and a taproom. As we approach Randolph Road, there is another node. Then residential and auto-servicing retail businesses dominate until Otto Avenue. There a new Mississippi Market co-op store, a Shalom House, and some other higher density (but by no means high density) development prevails. The road has an interchange with I-35E. We follow it past Montreal to the south side of Highland Park. 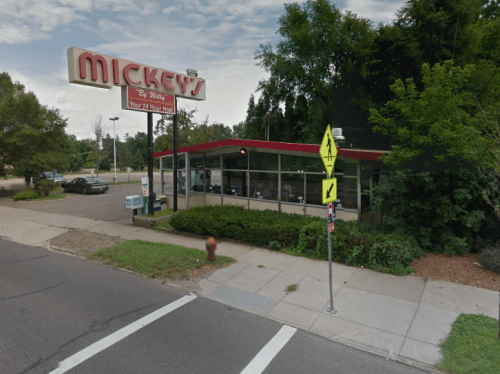 We see the Second Mickey’s as well as a Famous Dave’s. The north side of the road takes on a wilderness character, as it is a steep wooded slope. Pearson’s Candy is on the south side. The street becomes more residential, and then Sibley Plaza emerges on the North side, a strip shopping area. There is a surprisingly random new apartment building on Davern Street. Then the road becomes a grade-separated divided highway. 7th Street is one of those great pre-Interstate routes, one that lost a lot of business when long distance traffic migrated to I-35E, a route, that like Central Avenue and University Ave has seen better times. It was an early trail from Fort Snelling to Saint Paul that was geographically slated to be a significant transportation route. Running at a diagonal to the grid also makes it much more important, since that makes it a faster route, one which reduces the circuity of the network and attracts traffic. 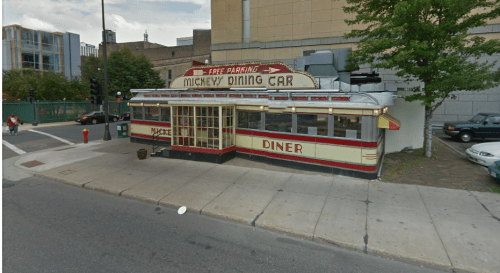 It was one of the early Streetcar routes, and the remnants of that remain. The region has plans for Arterial BRT. This is a good thing. The transit already gets use, this should make it better. The city is in contrast proposing a Streetcar. Although bike share systems are becoming more popular across the United States, little is known about how people make decisions when integrating these systems into their daily travel. For example, when more than one bike share station is located nearby, how do users choose where to begin their trip, and what factors affect their decision? In a study funded by CTS, researchers from the U of M’s civil engineering department sought to answer this question by investigating how people use the Nice Ride bike share system in Minneapolis and St. Paul. Professor David Levinson and graduate student Jessica Schoner examined how Nice Ride affects accessibility to jobs and developed a model to predict station choice. In the first part of the study, the researchers created maps showing accessibility to jobs by census block for both Nice Ride and walking—as well as the difference between the two—at time thresholds ranging from 5 to 55 minutes. At lower thresholds, fewer census blocks have job accessibility via Nice Ride because of the time it takes for a person to walk to the Nice Ride station. However, at higher time thresholds, Nice Ride provides an improvement over walking. Overall, in blocks with both Nice Ride and walking job accessibility, Nice Ride provides access to 0.5 to 3.21 times as many jobs as walking. Levinson and Schoner also developed a theoretical model for bike share station choice. The model considers users’ choice of a station based on their preference for the amount of time spent walking, deviation from the shortest path (the closest station may not be in the direct path of the person’s destination), and station amenities and neighborhood characteristics. Findings show that people generally prefer to use stations that don’t require long detours to reach, but a station’s surroundings also play an important role. For example, stations located near a park and in neighborhoods with lower crime rates were more likely to be chosen as the starting point of a bike share trip. Results also show that commuters value shorter trips and tend to choose stations that minimize overall travel time, while users making non-work-related trips choose stations that allow them to spend more of their time biking, even if the total travel time is longer. Understanding people’s station preference can help provide guidance to planners for bike share system expansion, densification, and optimization, Schoner says. “For instance, even though spacing stations along a route would allow people to walk in the direction of their destination to pick up a bike, people’s strong preference to spend more time biking indicates that clustering stations near where they are starting and ending their trips might make more sense,” Schoner says.